BLOOMFIELD, Conn., May 1, 2018 /PRNewswire/ -- Today, global health service company CIGNA (NYSE: CI) released results from a national survey exploring the impact of loneliness in the United States. The survey, conducted in partnership with market research firm, Ipsos, revealed that most American adults are considered lonely. The evaluation of loneliness was measured by a score of 43 or higher on the UCLA Loneliness Scale, a 20-item questionnaire developed to assess subjective feelings of loneliness, as well as social isolation. 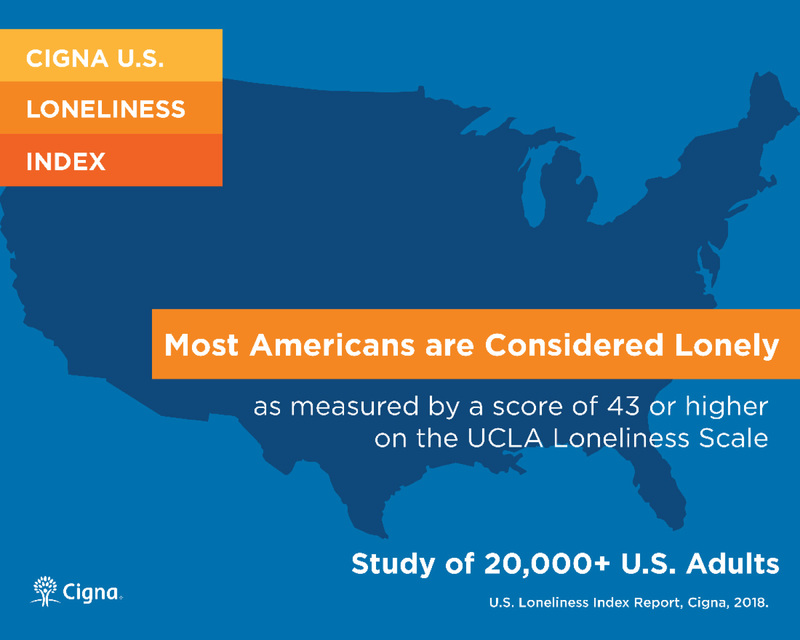 The UCLA Loneliness Scale is a frequently referenced and acknowledged academic measure used to gauge loneliness. "We view a person's physical, mental and social health as being entirely connected," said David M. Cordani, president and chief executive officer of Cigna. "It's for this reason that we regularly examine the physical, mental and social needs of our people and the communities they live in. In analyzing this closely, we're seeing a lack of human connection, which ultimately leads to a lack of vitality - or a disconnect between mind and body. We must change this trend by reframing the conversation to be about 'mental wellness' and 'vitality' to speak to our mental-physical connection. When the mind and body are treated as one, we see powerful results." Getting the right balance of sleep, work, socializing with friends, family and "me time" is connected to lower loneliness scores. However, balance is critical, as those who get too little or too much of these activities have higher loneliness scores. Sleep: Those who say they sleep just the right amount have lower loneliness scores, falling four points behind those who sleep less than desired and 7.3 points behind those who sleep more than desired. They are significantly less likely to feel as though they lack companionship (37 percent vs. 62 percent of those who oversleep) and are significantly more likely to feel like they have someone they can turn to (85 percent vs. 71 percent). Spending time with family: Those who spend more time than desired with their family and those who spend less time than desired are on par with one another when it comes to experiencing feelings of loneliness. Those who report spending too much time with family stand out as being more likely than those who don't to say that they feel as though they are part of a group of friends (73 percent vs. 64 percent) and they can find companionship when they need it (74 percent vs. 67 percent). Physical activity: People who say they get just the right amount of exercise are considerably less likely to be lonely. The loneliness score of those who exercise more than desired increases by 3.5 points, while a similar uptick is seen for those who exercise less than desired (3.7 points). Those who exercise more than desired and those exercising for just the right amount are on par when it comes to feeling as though they are part of a group of friends (79 percent, each), have a lot in common with others (75 percent of those who exercise more vs. 79 percent who exercise just right), and can find companionship when they want it (76 percent vs. 80 percent). The workplace: Those who say they work just the right amount are least likely to be lonely - the loneliness score of those who work more than desired increases by just over three points, while those who work less than desired showed a 6-point increase in loneliness. Not surprisingly, those who report working less than desired are less likely to report having feelings associated with being less lonely (e.g., feeling outgoing and friendly, there are people you can talk to, etc. ), compared to those who work more than desired. "There is an inherent link between loneliness and the workplace, with employers in a unique position to be a critical part of the solution," said Douglas Nemecek, M.D., chief medical officer for Behavioral Health at Cigna. "Fortunately, these results clearly point to the benefits meaningful in-person connections can have on loneliness, including those in the workplace and the one that takes place in your doctor's office as a part of the annual checkup. While one solution won't stop this growing public health issue, we've started to make changes to our business to help our clients and others to tackle loneliness and realize their vitality." Cigna is launching an effort to help address the loneliness epidemic and improve Americans' overall mental wellness and vitality. As a first step, the company is calling on other like-minded organizations to join in the fight against the epidemic. By working together, the hope is that a group of companies and organizations can develop solutions that help improve vitality and reduce feelings of loneliness for Americans. Cigna's Health Advisor program connects customers with health coaches who provide real connections and live advice to help customers understand what is going on in their lives and encourage them to make healthier decisions when it comes to exercise, healthy eating, stress management and tobacco use. The company's Health Information LineSM is always available, so customers can speak with a clinician directly to get advice on confidential health issues or listen to pre-recorded audio on a wide range of health topics. Last year, Cigna opened its counseling helpline to all veterans and their caregivers as well. Cigna's Employee Assistance Program (EAP) provides live telephone advice and practical solutions on a wide range of issues that can cause stress and isolation, including parenting and childcare, senior care, pet care, identity theft, legal and financial advice, and much more. Cigna's EAP also provides referrals to licensed behavioral health professionals to improve customers' mental wellness. Cigna's CLIMB (Changing Lives by Integrating Mind and Body) is a program taught in groups or one-on-one that is designed to help people manage chronic health issues that affect their day-to-day functioning and improve quality of life. The program also helps reduce the isolation that often comes with chronic health conditions. In Korea, Cigna's business has a program where employees call senior customers and their caregivers to provide a human check-in and alleviate potential feelings of loneliness or isolation. To highlight the importance of mental wellness as a part of regular medical care, Cigna is piloting a new initiative to better integrate behavioral health services into its collaborative care arrangements. The program will ensure that patients get the integrated care they need for their physical and mental wellness - as opposed to keeping physical and mental care separate. Additionally, loneliness has a profound impact on the workplace in terms of productivity. To help employers address this pressing issue, Cigna will convene a group of its clients to discuss steps that can be taken and potential solutions to improve vitality and address loneliness in the workplace. For more information on the comprehensive survey results and how Cigna is working to address loneliness and mental wellness across the country, please visit www.cigna.com. These are the findings from an Ipsos poll conducted February 21 - March 6, 2018 on behalf of Cigna. For the survey, a sample of 20,096 adults ages 18 and over from the continental U.S., Alaska and Hawaii was interviewed online, in English. The precision of Ipsos online polls is measured using a credibility interval. In this case, the poll has a credibility interval of ±0.8 percentage points for all respondents surveyed. The study's questionnaire is based on the UCLA Loneliness Scale, a 20-item questionnaire developed to assess subjective feelings of loneliness or social isolation. An index was created based on these 20 statements, which include a balanced mix of positive (e.g., How often do you feel outgoing and friendly?) and negative (e.g., How often do you feel alone?) statements, and respondents were assigned a loneliness score based on their responses to these questions. Higher scores indicate increased loneliness. Individual respondent scores were combined to obtain a total average loneliness score both nationally and across different cities throughout the U.S.
Ipsos is an independent market research company controlled and managed by research professionals. Founded in France in 1975, Ipsos has grown into a worldwide research group with a strong presence in all key markets. Ipsos ranks fourth in the global research industry. With offices in 88 countries, Ipsos delivers insightful expertise across five research specializations: brand, advertising and media; customer loyalty; marketing; public affairs research; and survey management. Ipsos researchers assess market potential and interpret market trends. They develop and build brands. They help clients build long-term relationships with their customers. They test advertising and study audience responses to various media and they measure public opinion around the globe. Ipsos has been listed on the Paris Stock Exchange since 1999 and generated global revenues of €1,780.5 million in 2017.